It is my heart, and the city has a resilience and a vibrant culture that is all it's own! First for the Alumnae Global Services Initiatives trip with Alpha Chi Omega Women's Fraternity. I blogged about my adventures here, here, and here. Why do I mention all of the above? Well, I keep getting asked my "must do" list for the city by family and friends. I am going to break this down into multiple posts.. 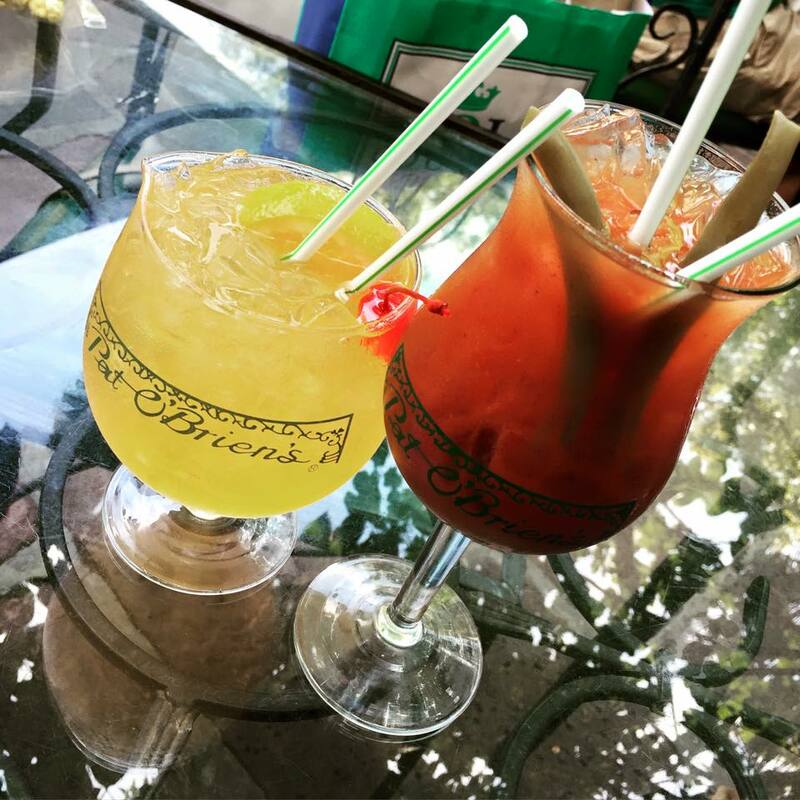 I am going to start in the French Quarter with some of my favorite locations.. becuase there is more to the Quarter than daiquiri's at Fat Tuesday's, having a hurricane at Pat O'Brien's (I prefer the Bloody Mary above) or a hand grenade at Tropical Isle. Those these are all quintessential tourist stops. If you follow my on Intsagram, some of these will not be a surprise as I post about then nearly every trip. 1. Cafe Pantalba- ok this one is special for a few reasons. History. Location. Food. Sentimental. History- The building was designed by the Baroness Pontalba in the 1800s. They were originally built as row houses, & later turned into luxury apartments. the Pontalba Buildings are known as the oldest apartment buildings in the United States. 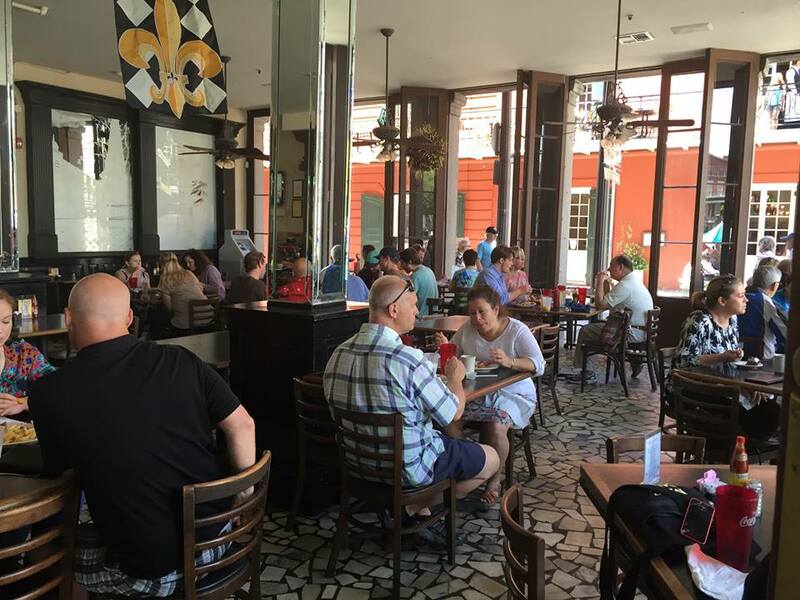 (fun fact the current Mayor and his family live above the restaurant) Cafe Pontalba pays homage to both the history of the buildings and to the food NOLA is known for. Location- historic Jackson Square, 546 St. Peter. Grab a seat, and enjoy the large open windows/doors. I could people watch for hours from this location. You can see the locals, tourists, and artists in the square and if you are lucky will enjoy some local music. Food- They specialize in Creole dishes like Shrimp Creole, crawfish etouffee, and Creole Red Beans and Rice. The restaurant also has great salads, pasta and PoBoys. I usually find myself having etoufee or jambalaya. Sentimental- My mom worked at the restaurant in the 70's (before I was in the picture) Back then the only worked for tips, and it was well worth it according to her. 2. Jackson Square/St. Louis Cathedral- night or day this is one of the most picturesque places in the quarter. Technically , Jackson Square in a historic park. It was declared a National Historic Landmark in 1960. 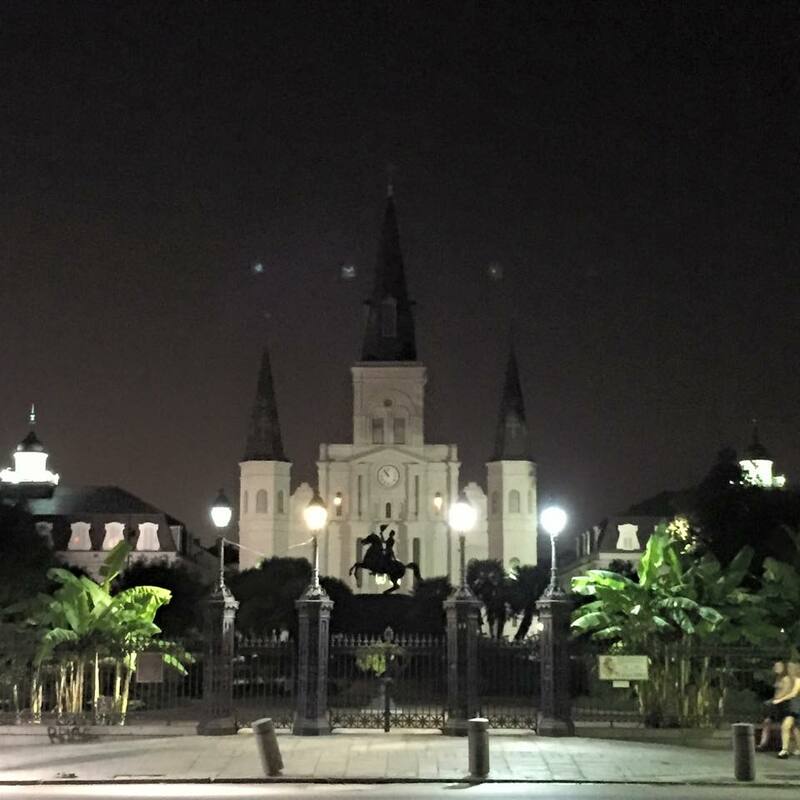 In 2012 the American Planning Association designated Jackson Square as one of America’s Great Public Spaces. But to me it is more than a park, it where tourists, locals and artists come together to showcase some of the things that set New Orleans apart. On any given day you can enjoy great food, amazing art, the sounds of local musicians all while taking in a historical landmark.During daylight savings time it's open from 8am to 7pm. During winter, it's open from 8am to 6pm. St. Louis Cathedral - The history of the Cathedral dates back to the 1720's, you can learn more about it here. It is truly beautiful, if you have the time take the self guided tour for a minimum donation of $1, or if you can plan ahead attend mass! 4. 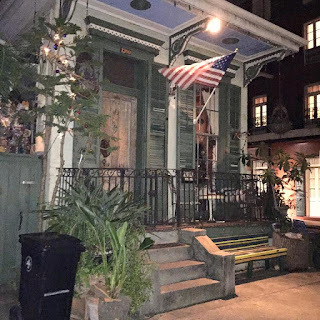 Frechmans Art Market- located at 619 Frenchmen St, New Orleans, LA 70116. The market is open Thursday - Saturday 7pm-1am. Here is the link to the page, be sure to check hours before you make the trip. 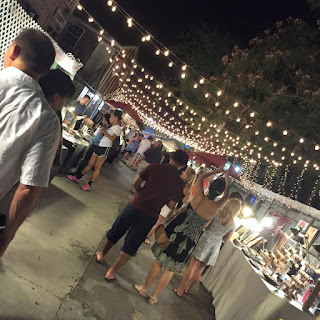 It is the only nighttime art market in Nola. It has local artists, musicians, and jewelry. 5. Café Du Monde: For beignets and coffee. Yes this is a quintessential Nola stop, but well worth it, and since it is open 24/7 (only closes for Christmas and major Hurricanes) you have no excuse not to visit. 813 Decatur St. right by Jackson Square. Grab a table and wait for service. Order up beingets (Beignets are square French -style doughnuts, lavishly covered with powdered sugar.) and a coffee. Note the coffee is dark roasted with chicory and is served Black or Au Lait. Au Lait means that it is mixed half and half with hot milk. 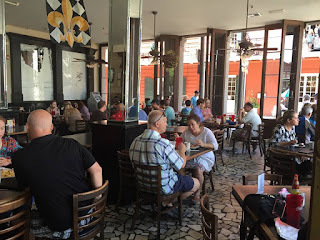 Truly one must visit and experience- after all the Original Cafe Du Monde Coffee Stand was established in 1862 in the New Orleans French Market... so it must be good if it is still open today!! 6. 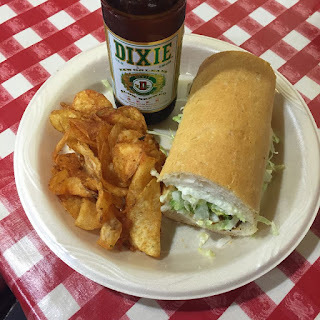 Central Grocery: Famous Muffuletta sandwiches, 923 Decatur St.
8. WW II Museum- it is on 945 Magazine Street. You can buy tickets online or at the museum. It is an incredible museum. Of course I am bias b/c my dad installed the lights, sound, videos, interactive displays etc. But all bias aside check it out- you won't regret it. 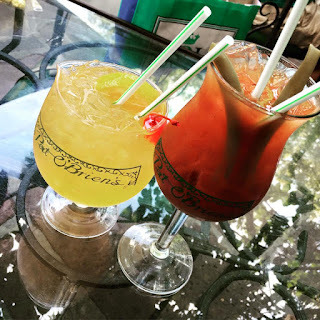 More of my New Orleans Favorites in the next post..
Love NOLA and love your list of favs! I have one you need to try next time down there, if you haven't already....Oceana Grill on Conti right off of Bourbon. Delicious!! I always get the Oysters Rockefeller and the Chicken Fettuccini Alfredo. You won't be disappointed!